And by hunting, we really mean bison watching. The Clog isn’t the biggest zoo fan and we’re not particularly fond of animal-watching — after all, how exciting could it possibly be? 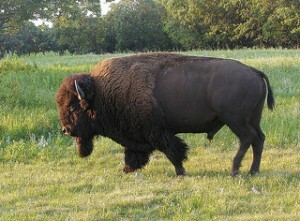 But when it comes to bison, well … how many times in your life are you gonna sight buffalo? Yeah, that’s what we thought. And thus, Sarah and Ben recreated and made SF a thriving area for bison romping. Or maybe not? Apparently there are only 5 bison left, all female, in relatively poor health. You can see them in the park off John F. Kennedy Drive, east of 41st Avenue. Looking at sickly bison may not sound fun … but they could possibly be the last ones left in San Francisco. Perhaps they should bring in President Grover Cleveland to stir things up. Afterwards, go for the irony and definitely grab some buffalo burgers  to commemorate what is sure to be a moving animal watching. Or, if you’re feeling sick, SF has its fair share of vegetarian options. Any suggestions as to what our next item should be on the summer bucket list? Feel free to comment below, or email us at [email protected]!